This is the second story in our Rest and Reflection series published during the festive season and written by people who are making a difference to Alice Springs. It is official: 2016 was the hottest year on record and in September we passed 400 parts per million of carbon dioxide in the atmosphere. You could be forgiven for missing this news or not realising it is profoundly significant, as it barely rates a mention – especially not here in the NT. Even writing on this subject this I know: I’m likely to see fact-muddying responses and outright dismissal in the comments thread. I’ve spent the last three years working on This Changes Everything, a global climate change project lead by Canadian journalist Naomi Klein and filmmaker Avi Lewis. My role took me to twelve countries and put me in contact with communities opposing extraction and building alternatives around the world including spending three weeks in Paris during the COP21 UN climate talks this time last year. Working between Alice Springs and New York and London was surreal in many obvious ways – but more surprising than the scale, traffic or weather it is the lack of concern for the impending impacts that climate change that struck me most when I returned home. As I was drafting this piece the small village where my sister and her family live in Bijagua de Upala in the north of Costa Rica suffered terrible damage and loss of life as Hurricane Otto made landfall. 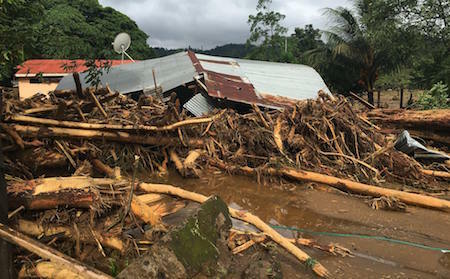 At least four people were killed in their village and many houses and properties were washed away by walls of water and mudslides. This was the first hurricane to ever hit Costa Rica, the southern most ever in the area and the latest ever in the season. The cause of this largest ever forming hurricane in the region has been put down to the exceptionally high sea surface temperatures in the region – 29C. Costa Rica is a world leader in renewables generated by a mix of solar, wind and thermal power. Between July and August this year they ran on 100% renewables for 76 days straight. However, being 100% renewable doesn’t protect against climate impacts and the devastating news sharply reminds me that we are all on this planet together – all responsible for the atmosphere we share. Here in the NT we are “highly vulnerable” to climate change according to the Federal government’s Department of the Environment. We are likely to see sea level rise, more frequent extreme weather events and temperature rises – in Alice Springs the number of hot days over 35C is expected to increase from 90 per year to up to 182 by 2070. And we can expect to these changes to have massive impacts on water, weather, tourism, agriculture, disease and health. So why the lack of action when this could undermine so much about what we love about this place, and perhaps even lead to this region becoming impossible to live in? I am astounded by not only the silence, not just the wilful indifference, but also by the mad enthusiasm for fossil fuel extraction in the Territory. I am struck that so many of our leaders, at a local level and Territory-wide, profess a deep love and loyalty to this place, yet by failing to act on climate change they are severely undermining our ability to sustain our lives here. I hear the same old economic arguments – they are well worn and recycled for every new proposal. Jobs and growth would be great for the NT – but the truth is that real long terms jobs and growth don’t lie in fossil fuel projects. I am heartened by the news this week of the Gunner government’s establishment of a Renewable Energy Panel – especially to see Alice’s local expert engineer Lyndon Frearson has been appointed to the panel. However for a shift to 50% renewables by 2030 to even make a dent in our emissions we have to stop pursuing any new fossil fuel projects in the Territory. We know that to face the climate crisis we need to do three things at once. Firstly we need to stop building any new fossil fuel infrastructure. Secondly we must put plans in place to rapidly transition to renewable energy. Good thing we know that the technology is ready for us to make this shift and that Alice Springs is uniquely well placed to lead this transition, especially with solar. And thirdly we have to put in place disaster preparedness to be able to deal with the climate impacts that we have already locked in, those that will occur even if we were to make this transition and end extraction today, like those that just hit my sister’s village. In this context it is sheer madness that the power station in Alice Springs be “upgraded” to operate on gas. The gas industry may well be positioning itself as the clean answer to coal and oil, but the evidence shows that this is far from the truth. Gas is not clean, it is not a bridging fuel and it gets us into just as much trouble with emissions and pollution as other fossil fuels. The proposed Northern Gas Pipeline – for which the pipeline materials are already starting to arrive in the NT even before the proposal meets approval under the NT’s environmental regulations – is another astounding example of the madness of the pursuit of fossil fuels. Not only is there a strong argument to be made that there will not be a market for the gas extracted in the NT, a infrastructure project on this scale will open vast tracks on the NT to gas extraction and essentially be a carbon bomb – releasing even more harmful fossil fuels in to the atmosphere at the very moment we know we have to stop and shift. We need leadership from governments, business and civil society to be driving an energy transition that will create jobs, that will create locally owned power and that will be a significant contribution to a much needed reduction of emissions. The frightening thing is that even though Alice is uniquely vulnerable the truth is there are really no safe zones where we can escape climate impacts. We are all – all of us on the planet – in this together and we have to take responsibility of our energy generation and use both for ourselves and for everyone else who we share this world with. I hope that 2017 is a year for real leadership on climate action in the NT. It hardly bears thinking about what will happen if it is not. 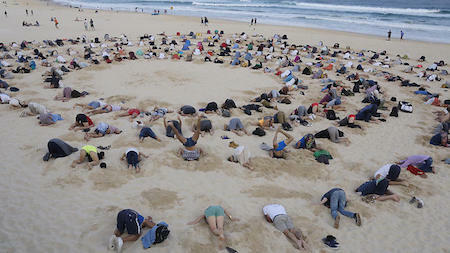 PHOTOS: Protesters burying their heads in the sand to show their disagreement with Australia’s climate policies in 2014 • Some of the impact of Hurricane Otto, photographed by Pip Varela Kelly, the writer’s sister • NASA graphic showing we passed 400 parts per million of carbon dioxide in the atmosphere.